Brewed with a cornucopia of deep, rich malts that complement a hearty fall meal, this spiced up Imperial Porter will have you asking for a second helping. Tired of the everyday pumpkin beer? 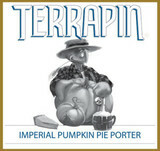 At Terrapin, we’ve set out to make one with more character…a lot more character. Bring this great feast of a beer to your favorite fall gathering and share with everyone who attends.